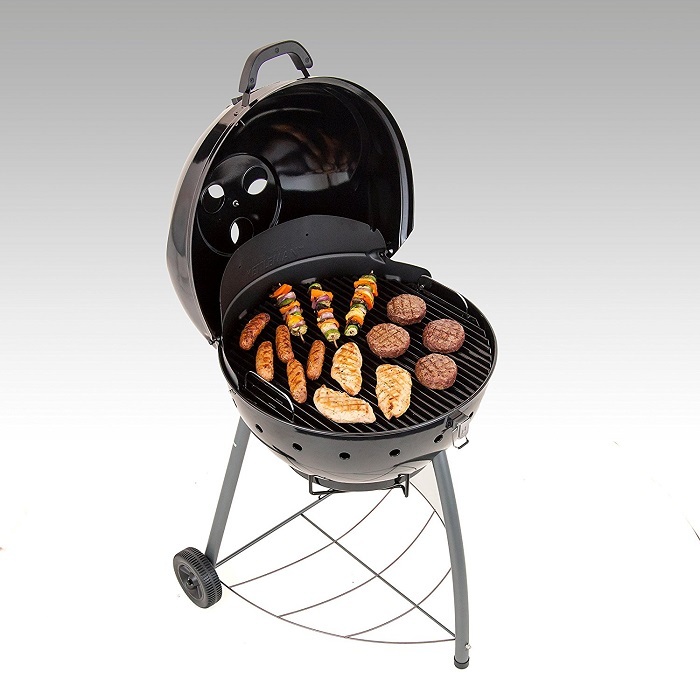 Kettleman Charcoal Grill Just $63.69! Down From $149! PLUS FREE Shipping! You are here: Home / Great Deals / Amazon Deals / Kettleman Charcoal Grill Just $63.69! Down From $149! PLUS FREE Shipping! Amazon has this Kettleman Charcoal Grill on sale for just $63.69 down from $149 PLUS FREE shipping! The Char-Broil Kettleman has 360 square inches of cooking space on a rust-resistant, porcelain-coated cooking grate. The no-fall-through cooking grate keeps food on top, prevents flare-ups and distributes heat evenly. The vent on the lid opens to let heat out and closes to increase cooking temperature, and for further control of the temperature and cooking, the charcoal grate is adjustable to bring the heat closer to the food or further away as needed. Two wheels offer easy mobility and a chrome-plated wire bottom shelf for stability and convenience. And the lid can be latched down to secure during transport. Charcoal kettle grill with a 360- square inch total cooking surface. 22.5-inch diameter porcelain-coated cooking grate keeps food on top and prevents flare-ups. Hinged lid with mounted temperature gauge for ease of operation and temperature monitoring. Removable ash bowl for simple clean-up; engineered to operate with less charcoal than others.